A while back, I presumptuously submitted my effort for Modern War Institute‘s War Books Profile series, where it has languished on the slush pile for a few months now. No need to waste a decent post, though, so I’m posting it here, locally, on Zenpundit, for any who may be interested. Charles Cameron is the managing editor of the strategy blog Zenpundit, and a past Principal Researcher with the Center for Millennial Studies at BU and Senior Analyst at The Arlington Institute. He is a three time finalist in the Atlantic Council Brent Scowcroft Center’s Art of the Future challenges, and author of the essay “The Dark Sacred: The Significance of Sacramental Analysis” in Robert J Bunker, Blood Sacrifices (a Terrorism Research Center Book). He is the designer of the HipBone family of conceptual games, and is currently working on a book on religious sanctions for violence titled Landmines in the Garden. Mustafa Hamid & Leah Farrall, The Arabs at War in Afghanistan. Respectful enemies – he, a friend of UBL and Mullah Omar, she, a counter-terrorism expert for the Australian Federal Police – debate and confer across battle lines to draw a detailed picture of AQ structure and history. A unique collaboration. William McCants, The ISIS Apocalypse. The key to ISIS intensity has to do with what then-Chairman of the Joint Chiefs Dempsey called their “apocalyptic, end-of-days strategic vision.” McCants masterfully reveals that apocalyptic driver, and the somewhat obscure scriptures on which it is based. SH Nasr, ed., The Study Quran. With enemies such as ISIS and AQ that are given to quoting scriptural texts, it is important to have a reputable, non-sectarian translation and scholarly commentary on the Quran. This is that book. Hegghammer & Lacroix, The Meccan Rebellion: The Story of Juhayman al-‘Utaybi Revisited. A slim volume, a delight to hold in the hand, and packed with detailed scholarship on what is arguably the seed moment of contemporary Jihadism. John Kiser, The Monks of Tibhirine. This book, and Christian de Chergé’s astonishing letter to the jihadists who would shortly martyr him, is an eloquent testament to values we should cherish in a time of brutality and hatred. Hermann Hesse, The Glass Bead Game. The human mind, attuned to variety and complexity yet primed to understand complex matters in binary terms, tends to hold war and peace as poles apart. Musically speaking, war is equivalent to discord, peace to harmony. The musical technique of counterpoint, so central to Bach, plays “voices” against one another in a manner that recognizes their variety and individuality and allows for discord while constantly working to resolve it harmoniously. It thus offers us an analogy for the constant interplay of warlike and peaceable motivations, both within the individual human and among the world’s societies and cultures – an invaluable overview of the natural condition. Hesse’s novelistic Game shows analogy rather than linearity as the key to creative insight, and offers a contrapuntal play of ideas as the overarching architectural structure for comprehending a world of conflict and resolution. It won the Nobel. Reworking my list today, I might well reckon the McCants book has served its brilliant purpose, illuminating in fine detail the apocalyptic nature of ISIS theology, and substitute a no less valuable but more wide-focus tome, Shahab Ahmed’s What is Islam, which broadens our understanding by offering a comprehensive exploration of “lived Islam” across the centuries and continents, going far beyond “scriptual” Islam as understood by the fundamentalists. 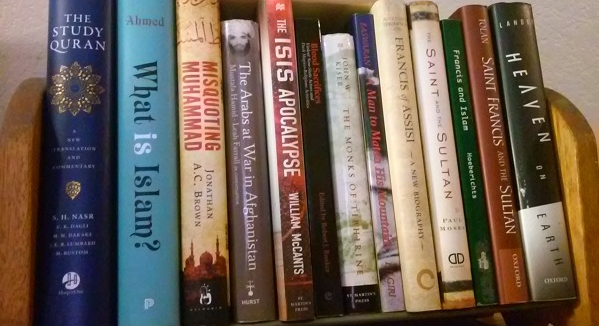 Ideally, of coure, there’d be room for both McCants and Ahmed, as there is in the tiny bookshelf on my desk.. This entry was posted on Tuesday, April 25th, 2017 at 1:33 pm	and is filed under bach, book, Charles Cameron, Glass Bead Game, hegghammer, Hipbone Analysis, Hipbone Games, leah farrall, monasticism, recommended reading, robert j. bunker, scriptures, Uncategorized, war, will mccants. You can follow any responses to this entry through the RSS 2.0 feed. Both comments and pings are currently closed. Great post! I have read none of these books, sir! Zenpundit.com is contributing to my poverty! Keep those titles coming. Charles, thank you for this post. I have been looking for a cite to a reliable translation of the Koran, and it looks like this is the one. The Quranic Arabic Corpus is another invaluable resource. Of the versions there, Mohsin Khan is the English version the Saudis used to push, and if you look at the parentheses in Sura 1 v 7 you’ll see the additions they made without giving warning that the words in parens are not found in the Arabic. It’s good for knowing the Salafist reading of the text. Arberry, the last one listed, is fine in bth meaning and grace of language — an important facet of the Quran. Nasr’s Study Quran is (a) Sufisticated, (b) well adapted to the west, and (c) has the inestimable benefit of serious and wide-ranging commentary. What do you mean by “Sufisticated”? Also, what do you mean by ” well adapted to the west”? Perhaps it is a product of my University of Chicago education, but I’m interested in a translation which is as literal as possible, and which is not trying to make any pre-fabricated case for one interpretation over another. Over the centuries there of been sophisticated societies which purported to be based on the Koran. And in our current age we have psychotic death cults, which are relying on the same Arabic original text. I would like an English translation which does not provide a predigested variant, which is in effect arguing for a more or less but nine version of the Koran by how it translates it into English. Do you know of such a very literal, “Straussian” translation? SH Nasr is a University Professor at Georgetown, and technically a follower of Frithjof Schuon and the “Traditionalist” school of Perennial Philosophy, which sees in all the major religions avenues towards mystical union combined with local ethical paths for those not involved in the “direct ascent”. This naturally brings him into the sphere of sufism, although I do not understand him to be associated with any particular tariqat or Sufi order. That plus the general meaning of sophisticated is what I meant by “sufisticated”. Translation of the Qur’an has always been a problematic and difficult issue in Islamic theology. Since Muslims revere the Qur’an as miraculous and inimitable (i’jaz al-Qur’an), they argue that the Qur’anic text should not be isolated from its true form to another language or form, at least not without keeping the Arabic text along with. Furthermore, an Arabic word, like a Hebrew or Aramaic word, may have a range of meanings depending on the context – a feature present in all Semitic languages, when compared to the moderately analytic English, Latin, and Romance languages – making an accurate translation even more difficult. Exploring the various translations in the Quranic Arabic Corpus linked above will give you an idea of the range of Enlish versions possible for a single Quranic verse in Arabic — sometimes the general meaning is pretty clear, often the ambiguity and poetry is distinctly hard to capture in a single English version. Namecall namecall-brooking : no forewonted namecall. Having-aught namecalling : Myriad Mottlings’ mother. — the latter being a philologist’s best attempt to capture all the nuance found in the original text. The book has many strengths. For one, the SQ incorporates prophetic traditions (?ad?th) into the commentary, something that I suspect will not please structural reformists who anchor their efforts in a Quran-only epistemology. In addition, the SQ is not a work colored by the ideologies and agendas of secular liberalism (in its many forms). It makes no apologies for verses that appear inegalitarian, malevolent, or otherwise discordant with the metaphysical commitments of contemporary liberal society. Instead, the SQ contextualizes, elucidates the tradition, and offers an understanding of those verses within terms that the Muslim community (or at least some portion of it) has understood them for over a thousand years. This, I suspect as well, will not gratify reformists who view the majority of premodern jurists and theologians as having been prejudiced by patriarchy, exclusivism, and militarism. Thank you, Charles. It sounds like the SQ is the best version to go with. His book is a deep dive into their eschatology. This talk gives a recent comprehensive overview. And again, The Glass Bead Game – was fascinating to me – and one of my favorite books of all-time. Actually still processing everything that it said to me. You and Mark keep up the great work – I am a faithful reader (and fan) of you guys! ‘Can the polysemic and nomadic meanings of a text such as the Qur’an overcome the unbewised to reduce it to a monologic decree? MICHAEL M. J. FISCHER & MEHDI ABEDI, Debating Muslims: Cultural Dialogues in Postmodernity and Tradition, 148; see also ANDY RIPPIN, ‘Reading the Qur’an with Richard Bell/ Journal of the American Oriental Society, 112 (4), 1992, 639-647,esp. 637. Not that I’ve gone that far afield.. I will truly attempt a decent email to you today, long overdue!